Dorril documents the shift from anti-German to anti-Soviet priorities, which began in the latter stages of the war, and soon saw MI6 working with former Nazi collaborators. Ironically, one agent who was quick to adapt to the new agenda was the NKVD mole Kim Philby. Although Dorril attempts to correct what he sees as an over-emphasis on the activities of the Cambridge spy ring, Philby's shadow inevitably looms large over a period when Western efforts to launch covert operations in Eastern Europe were persistent failures. The paranoia brought about by Philby's 1963 defection would only begin to subside in the 1970s, with the defection of Oleg Gordievsky, who confirmed that the KGB had no major agents inside British intelligence. The episode cast a major cloud over Anglo-American intelligence relations which became increasingly important to MI6 over the years because of the Americans' greater technical capabilities, especially after the advent of satellites. One area where Anglo-American co-operation regularly alternated with rivalry was the Middle East, to which Dorril devotes a very useful section of the book. He argues that it was MI6, rather than the CIA's Kermit Roosevelt, who were the ultimate authors of the fateful 1953 coup against Mossadegh in Iran. This event convinced the head of MI6's Middle East section, George Kennedy Young, of the effectiveness of covert operations, a conclusion that would have implications for Britain's private cold war against Nasser, both before and after Suez. 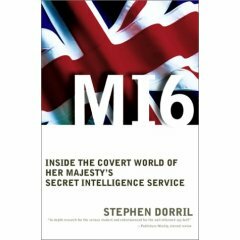 In the final chapters, Dorril deals with MI6's transition to the post-cold war era. Although the book was written before 9/11, it is clear that many of the trends now ascribed to that event, such as a focus on terrorism, the Middle East, and weapons of mass destruction, were already emerging in the 1990s. This book covers a huge swathe of ground in immense detail. While the casual reader may find themselves getting bogged down in some of the details of central European exile politics, Dorril offers rewarding insights into Britain's role in the modern world. One can only hope that his planned volumes on MI5 and Gladio also materialise.